As we round the bend into the 3rd week of Lent, we come across a parable that truly borders on the mysterious. Why would the average person turn down an invitation to what was certainly a lavish affair? All of the finest of everything from food to table settings. No holds barred. No expense spared. Was the king a tyrant of a man who abused his power and his privilege? Or were people's schedules so booked that they couldn't make space or time? The parables teach us lessons in what would seem to be a backsided manner. The message hidden underneath some ridiculous details. But nonetheless, they are there. We arextended an invitation, to the social event of the year, we certainly can't pass that up! 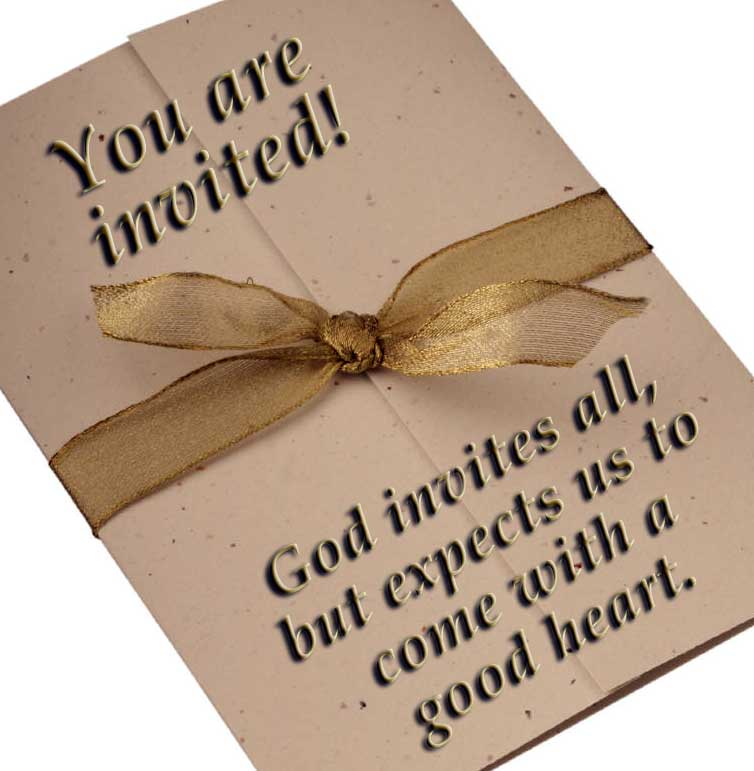 Let's see what we discover as we receive "AN OPEN INVITATION". ALL are welcome to join us on Sunday morning at 9 or 10:30 a.m. Please donate fresh flowers for the outdoor flower Easter cross that Nancy & Tricia Valenta create. Any kind of fresh bouquets can be dropped off in the kitchen by Saturday morning April 20 or cash donations by Palm Sunday. YES, there are 5 Sundays in March. YES, we will have 1 worship service at 10:00 a.m. on March 31st. NO, we will not have a meal after worship service. YES, you are welcome to join Pastor Danita at one of the local establishments for brunch after service. If you are interested, please let her know. We will decide where to go based on the number of people. ALL are welcome to attend. Many people have asked about the purple vestment that Pastor Danita wears during the Lent season. It is a gift from her friend, Reverend J. Jeannette Cooper, retired clergy woman in South Carolina, which Pastor Danita wore as a part of Reverend Cooper's wedding ceremony. It was handmade in Ghana, Africa and the symbol on the sleeve means "believe in God". There are only 12 of these vestments which were made exclusively for Reverend Cooper's Sisters in Spirit (S.O.S.) who served communion at the wedding ceremony. Confirmation Sunday is Sunday, May 5th. There will be ONE Worship Service at 10am. The Adventurers will be going to Suparossa on Saturday, March 23rd at 5:00 pm. Please contact Rick or JoAnn Cihlar TODAY, if you are interested in attending. Talley Inc. has a new facility in Woodridge, IL and are excited to announce that they are hosting a job fair on March 26-28 at 9am-3pm in their offices at 2143 International Pkwy Suite 400 in Woodridge. They are a Family owned business that has been in business for 35 years. We are headquartered in California and have a total of 11 facilities. They offer employees’ a great benefits package and competitive wages. Please check them out www.talley.com. There is a flyer posted in the narthex. There will be no yoga this next week. Youth Gift Cards are Back!! Support WUMC Youth with gift card orders for Easter baskets, confirmation or other gift giving occasions. Orders are due April 7th and will be available for pickup on April 14th. A percentage of all sales goes to Youth Ministries. Our WUMC congregation, friends and family served over 60 homeless guests at PADS in February. WE JOINED TOGETHER AND MADE A DIFFERENCE!!! THANK YOU TO ALL WHO DONATED FOOD OR SERVED. Our next, and last, service dates for this season are: APRIL 16 – 17, 2019. Please check the sign up sheet in the narthex for your contribution information.